Gardening in Canada can be frustrating. 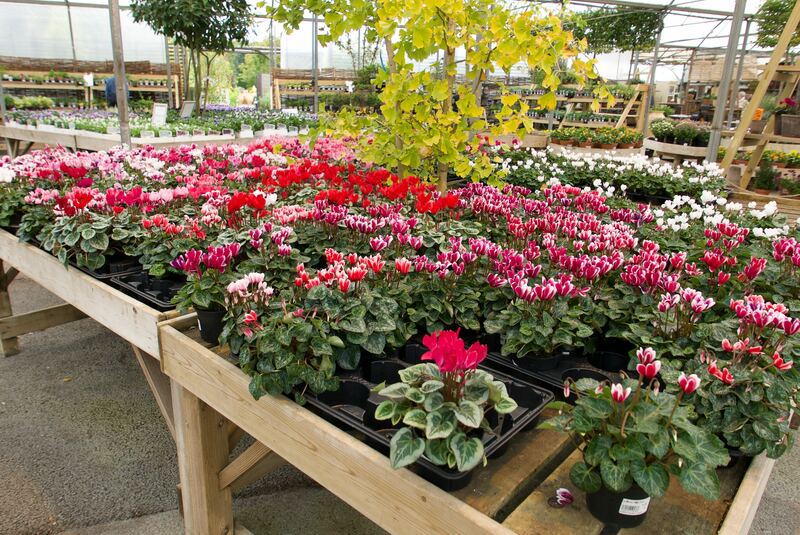 The range of plants available through nurseries or garden centres is minuscule compared with the number available in England. And seeing so many wonderful cultivars that won’t survive in my Quebec garden makes me envious of England’s more temperate climate. Still, for anyone who loves plants, a visit to a garden centre is always a treat. The group I was hosting on my final garden tour spent a few happy hours wandering around the Burford Garden Company, an Oxfordshire-based enterprise. At this time of year the stock of perennials is low but there were still four Anemones to choose from — Queen Charlotte, Hadspen Abundance, Whirlwind, and Dreaming Swan. At the best of times I’d be lucky to find one or two, and none of those available at Burford. 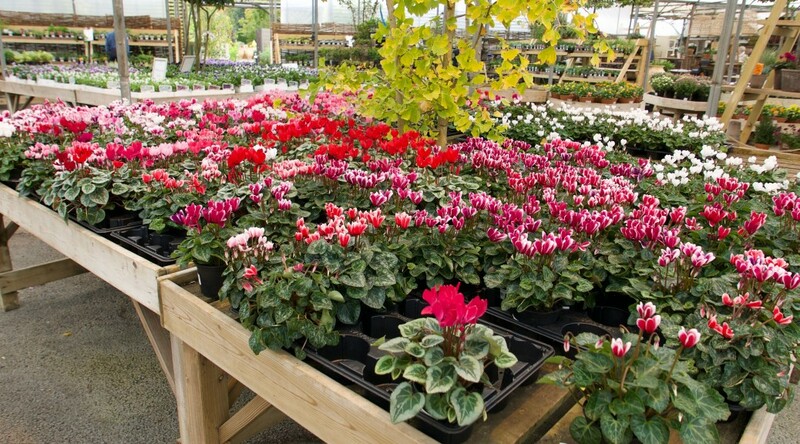 A table of cyclamen made a nice display, and at £3.50 (Cdn $6 or US$5) for a 10.5 cm pot, the price was right. Plus there were eight or nine colours to choose from. Several displays of clipped boxwood caught my eye, and made my wallet wish I could magically transport the plants to Glen Villa, my home garden. Prices for the boxwood balls went from £30 (Cdn $50 or US $40) for the smallest to £175 (Cdn $300, US$230) for the largest. 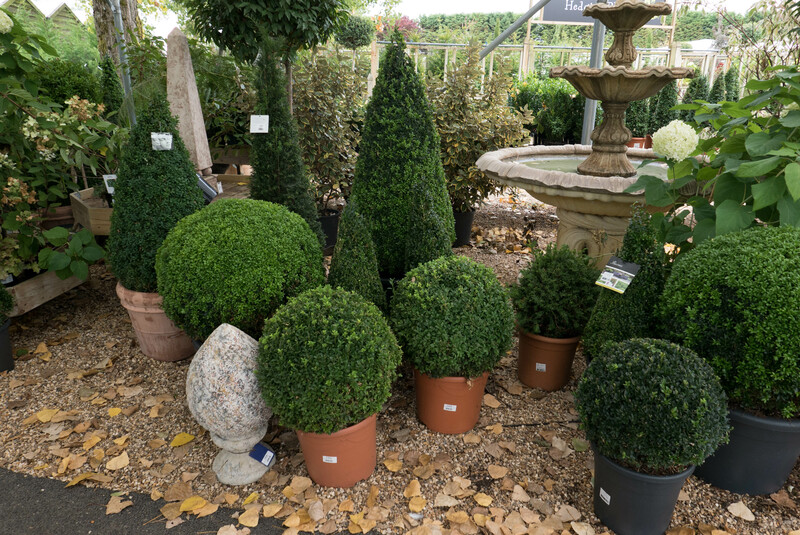 The boxwood cones ranged from £35 (Cdn$60, US$45) to £195 (Cdn$330, US$255). There were some hidden bargains. The largest cone in the photo above was priced at £195, the smallest at £125, while the mid-sized cone was only £85 (Cdn $145). I’d pay that much for something much, much smaller — if it was available at all. 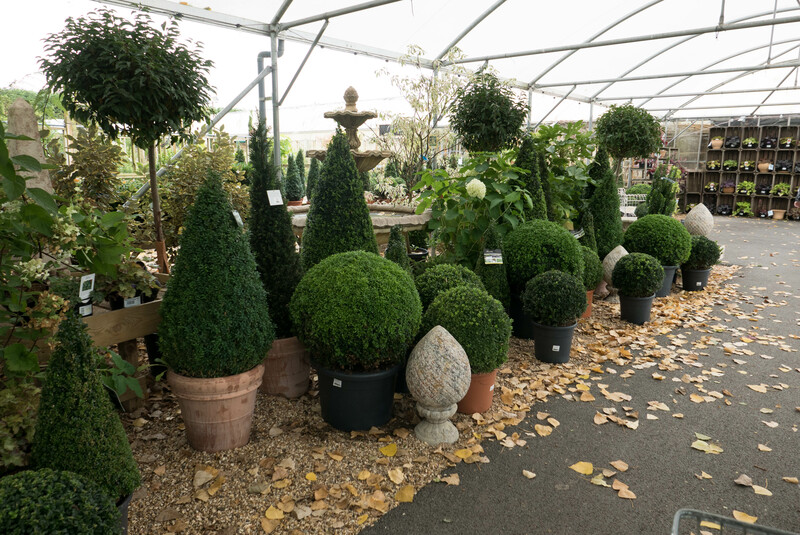 Paul Gilmour, the man in charge of plants, explained the price disparity, saying that most of their boxwood are imported from Belgium and that exchange rates vary, as do individual prices depending on the quantity the company buys. 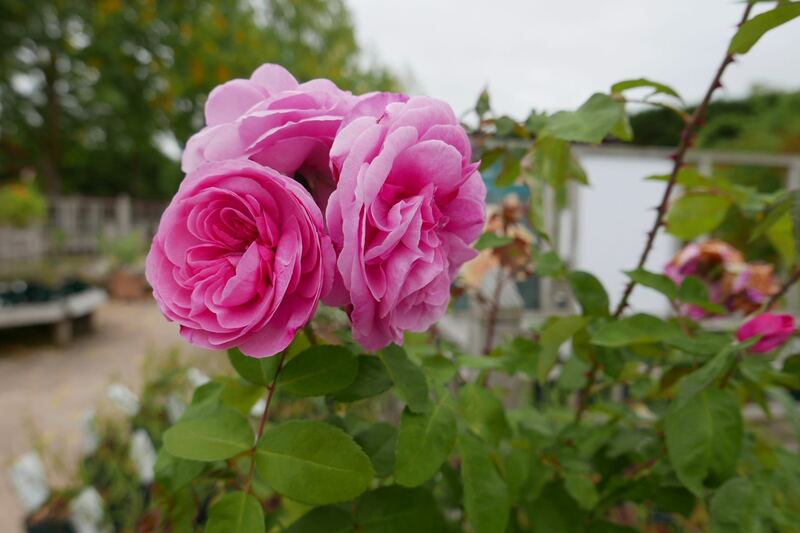 Roses were in short supply but scenting the air was a Gertrude Jekyll rose in full bloom. Wandering through the plants, I spotted one that I happily left for another buyer. 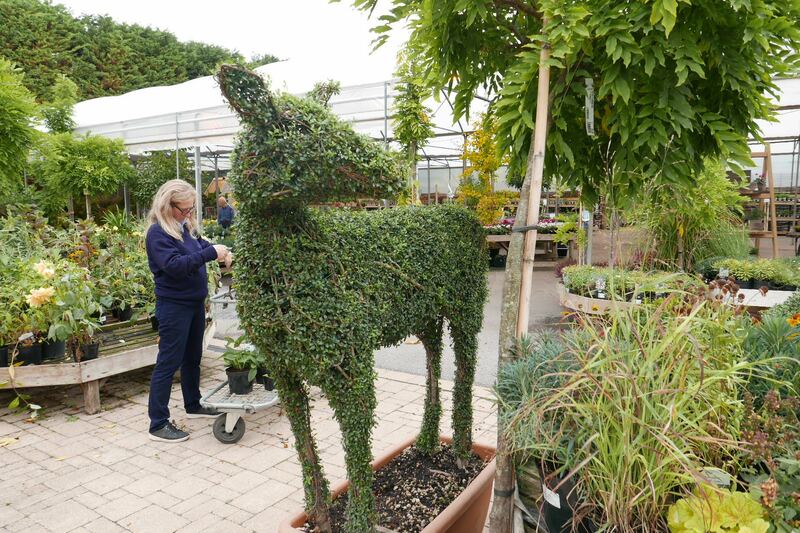 I don’t need a topiary deer — I have far too many of the real thing! This little guy can be yours for only £2150. I’m back in Canada now, enjoying some beautiful autumn weather. Over the next weeks (months? ), I’ll be reviewing many of the gardens we visited on this final tour. They included public and private gardens, large and small gardens, historic and contemporary gardens. Some were designed and maintained by the garden owner alone, some were designed by professionals and had large gardening staffs. On each of the tours I’ve hosted, tour go-ers have been asked to rate their favourite five gardens. This is hard to do when the gardens themselves are so different. Which garden is ‘best?’ What criteria can apply fairly to all? So here’s a challenge. What is the best garden you’ve visited this year? Anne Wareham, editor of the on-line journal ThinkinGardens, is asking for reviews. “A small competition everyone – be a star and write me a piece about the best garden you’ve visited this year. Remember – this is thinkingardens. I don’t want any ‘lovelies’ or long winded description and tour of a garden. I want to hear about what touched you, what the spark of excitement was about it, what stayed with you after you left. How brilliantly the maker has responded to context, limitations, challenges and inspiration. Any size garden. And I want to hear also about the downsides – no garden is perfect and I won’t believe you if you try to tell me it is. I don’t want to hear more than necessary about plants. And I’d like to learn something from your piece. To see a new perspective, an aspect of garden making I’d never imagined. A way of looking or seeing that opens my eyes. Let’s be clear – this is not going to tell us which are the best gardens in the world. That is not the point nor is it possible. I plan to send a review… and I hope many readers will, too. First, of course, I have to decide which garden I will choose. Does my own garden count? I sympathize about deficient nurseries, Pat. Ours are (mostly) unable or unwilling to offer many plants I seek. I’ve been trying to find Aster ‘Violetta’, for example, for several years. It’s so visibly popular in Europe, you would think some nursery in North America would get the point and offer it. But I still can’t find it. A friend in London bought me two but, of course, I can’t get them into the US. I grit my teeth and keep trying to convince my local nursery to improve the selection. No luck so far… but let’s keep trying. Trees are taking their time here in Victoria! Not much change in colour here yet either. Soon, though… temperatures are dropping. I have read of gardeners who got permits and brought plants over from Europe. That was several years ago, so perhaps it’s gotten harder to do, or more expensive. It wasn’t an easy process even then. And I hear you on the jealousy, too. Every time I watch Gardener’s World I’m reminded again of what a great gardening country Great Britain is. I’m sure the climate contributes to it, but they have more and better gardening television programs, more people gardening, more private gardens open to the public, and as you point out–more plant choices at their garden centers. And then to watch Monty Don drive a stake two feet into the ground without hitting a rock–it doesn’t even cross his mind that he might hit a rock! I can’t go six inches without hitting one. I try to console myself that they can’t ripen tomatoes without growing them in a greenhouse, but then I remember they don’t have to dig below the three foot deep frostline to build the foundation for their greenhouse, and then it’s no consolation whatsoever. Better to think of Quatre Vents, that a magnificent garden can be created in the coldest climate. Kathy, you make me laugh. I agree, to drive a stake without worrying about rocks is a luxury we don’t have. Lots of things can be consoling but the envy remains! I’m glad I could make you laugh. I guess that’s one reason I enjoy watching Gardener’s World–it’s just such a different gardening world. Every so often I do pick up a tip, but mostly I watch to see how the other half gardens. I’ve ruled out doing my own garden …. I didn’t ‘visit’ it as much as live in it so I decided it didn’t qualify.